The thick high relief frame of the Williamsburg Estate Wall Two Lines Address Plaque provides a distinctive appearance and adds a classic touch that helps your entryway stand out from the rest. • Select from 6 color combinations. 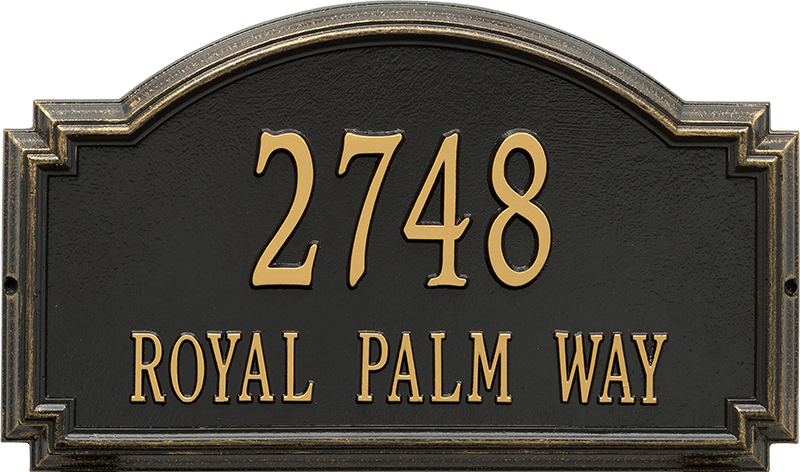 Williamsburg Address Plaque (Wall) 12" x 20.5"
Available in 6 durable all-weather powder coated colors. Made of 1.25" thick cast aluminum with an exclusive Alumi-Shield™ coating that was developed to withstand the harshest elements, repel UV rays, and maintain the appeal of the plaque - enhancing the durability. Line 1 holds up to five 4" characters and line 2 holds up to fourteen 1.75" characters.